The following documents provide extensive information about my mission to the media and journalists, as well as to the institutions / associations / universities / schools, etc. who wish to invite me to participate in their activities. Do not hesitate to contact me for any further information. 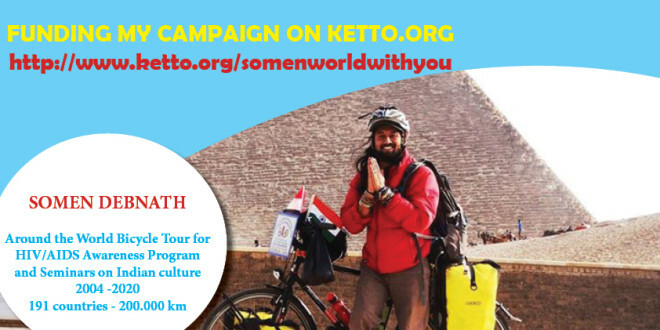 Somen Debnath_Presentation_Press Kit_2013 (new) (pdf format, click to open & dowload) – detailed information about my journey & mission. Media Coverage / Revue de presse (click to open it) This document contains the articles in the written press and the link to my TV interviews regarding my journey and my mission. Dossier de presse (français) (click pour ouvrir) Le dossier de presse contient toutes les informations sur moi et mon voyage autour du monde, ainsi que sur ma mission.